Each course is organized so that you always know what to do next. 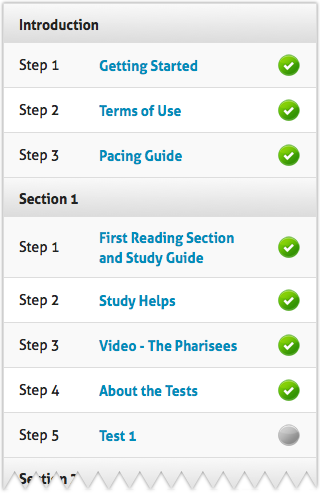 The overview box is visible on every page within the course, allowing you to see your progress at a glance. You will be able to revisit any previous step while you are enrolled in the course. Just as God chose the written Word to speak to us, Through the Scriptures is at its heart a reading-based school. Each course follows a volume in the Truth for Today Commentary series. Provided in digital form, each volume will serve as your “study text” throughout the course and will be yours to keep after the course is complete! Click below to download a short sample of the study text from the first course, The Life of Christ, 1. The study text will be divided into five reading sections with a test following each section. In order to help you prepare for the tests, each reading section comes with a study guide to identify key terms and concepts that you will need to know. Click below to download the first study guide from The Life of Christ, 1. Some courses come with additional downloads such as maps and charts that will be of use to you as you study. Click below to download one of the study helps from The Life of Christ, 1. Some courses have supplementary videos that cover topics that go along with the course. Below is a video that is part of The Life of Christ, 1 course. There are five section tests and one final, comprehensive test, and you will be able to take each test when it is convenient for you. A test has up to fifty questions of the same kind that you see in the sample below. The tests will be graded, and the results will be shown to you immediately after you finish each test.